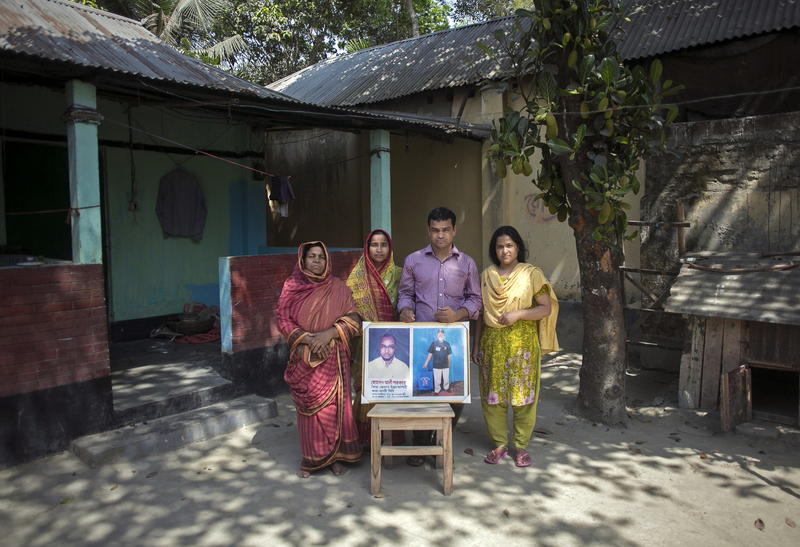 The wife and children (L-R Ambia Begum, Hasina Begum, Rahul Amin Azad, and Nasima Akhter) of Christian convert Hossain Ali, who was murdered by ISIS, hold his photograph as they pose for a photo in Kurigram, Bangladesh. On March 22 Ali was taking his usual morning walk when he was attacked and died. Ali was a Navy Commander during Bangladesh's 1971 Liberation War, and converted to Christianity 16 years ago. The police warned him and his family to be careful and limit their movement because of the ongoing security issues, but Ali felt safe since he said he had no enemies. ISIS claimed responsibility for his murder. He is remembered as a gentle, simple and happy man, and he leaves behind a wife, mother, and three children.